Roughly trade paperback size (6x9) softcover, 212 pages. For those of you who purchased Ritterkreuzträger but were unable to read the 160+ pages of text that outlined the award recommendation process and the issues associated with the award of the Knight's Cross in the waning months and weeks of the war, this is the book for you. 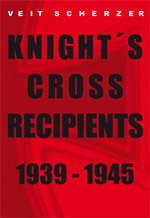 In addition, all 200+ recipients whom the author contends should not have been credited with receiving the Knight's Cross (or one of its higher levels) have been listed, along with the reasons for that conclusion. Now you can read why the original German edition was so contentious in Germany (and the Knight's Cross Association distanced itself totally from the work). In no way does the author slight the accomplishments of the vast majority of those previously credited with the award. Instead, through judicious research, he shows why the award should never have been credited: Either having been ""awarded"" by someone not authorized to approve the award"